The exams are most feared for their extensive material coverage and their time-sensitive atmosphere, but ample preparation will prevent any time-crunches on the day of the exam. What’s an AP exam? A $115, three-hour test that requires in-depth knowledge on a subject accumulated over the course of a year and analysis of the events and concepts. A test that, if passed, can qualify as college credit, saving future funds and time. Do not fret! Taking the class and following through on all the required schoolwork during the school term provides a really great foundation for all the knowledge needed on the exam. The teachers know what they’re talking about and are familiar with what students should expect on test day. Whatever they advise students to know and be especially familiar with is important to highlight. Take the initiative and design a study plan using materials that is personal and efficient. Rheinhardt, who has taken two exams so far and will be taking three more this year, prefers the Barron study books and starts studying a month before the exams begin. Of course, the exam isn’t a required task for the classroom grade. Some students even take exams for subjects they never took traditional classes for. It’s all about being prepared: knowing how the tests are designed, how to format free responses and what materials are needed to take the exam. There are countless materials like study books and cram packets available online, in bookstores and in libraries for students to access that will help concentrate all the information needed pertaining to any AP subject. Additionally, most AP teachers at Sage Creek will plan a day for students to take a full-length “mock” exam to simulate the setting and format of the actual exam. These are very helpful in revealing to students which concepts and content they need to review for the actual test in May. Senior Alexis McBride will have taken seven AP exams total by the time she graduates. 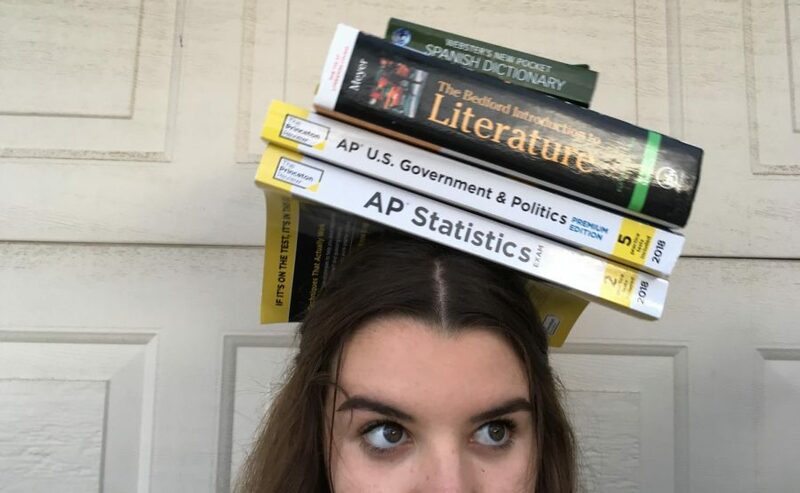 At least a couple months before exam season, she researches the best study books for the subjects she’s taken on Best AP Books, paying attention to the expertise of teachers and reviews of past test-takers. Studying ahead of time is the best strategy she’s learned, starting two weeks before her exams to review the content of her courses. Especially helpful with the history and even government or economics courses are timelines: collecting all the major events and their contributors into a concise, easy-to-read document. Teachers can help, they will know which events and concepts are most commonly included in the exam. However, timelines and flashcards don’t exactly apply to language and composition courses, such as AP Spanish or AP English Language and Composition (AP Lang). Shannon Alberts teaches the AP Lang class at Sage Creek and emphasizes to her students the difference between a content-based course and a skills-based one. With composition classes, the exams are based almost entirely in writing, so knowledge and awareness of current events and topics are important in introducing or connecting the ideas of an essay. Instead of cramming in definitions of literary devices (which are also important, though), try turning into a news station or reading an article a day. Having insight into topics outside the hard-line subject of the exam could be the difference between a lackluster essay and an impressive one. This applies to social studies, too! An irregular sleep schedule, a junk food diet and a messy study plan are no helpful means to achieving any goal, especially the goal of passing these exams. Whenever it gets overwhelming, remember to take a breath and a step back. All the materials needed are within grasp, one step at a time. So gather up the pens, calculators and thoughts and walk into that exam with the confidence that a year’s hard work will not go to waste. Good luck!